Before and after photos are taken by Hydraquip’s engineers and are stored on the Job Manager App allowing customers to clearly see the work that was carried out. A selection of photographs must be taken on each job clearly showing parts including the machine in full view, manufacturer’s serial plate, failed part, oil level and hose label. Hydraquip offer full traceability on all jobs and the parts that were used through the use of asset tagging with a unique barcode and serial number labelled on each hose, with details available on a searchable database. Hydraquip’s hydraulic trade counters have the in house capabilities to manufacture hydraulic hose assemblies to pattern, providing an instant over the counter service. The comprehensive stocked range offers hydraulic hose and fittings manufactured by reputable companies with assemblies manufactured in accordance with the guidelines and standards set by the BFPDA. Hydraquip manufacture hydraulic hose assemblies for scheduled or call off orders, including kanban supply. Each of the hydraulic trade counters across the UK carry a comprehensive range of hydraulic hose and fittings, with hydraulic hose stocked from DN06 (1/4”) up to DN50 (2”) with SAE specifications from SAE100R1AT right up to SAE100R15 ensuring all applications are catered for. Hydraquip’s On Site Hose Service is operated by fully trained and experienced hydraulic engineers offering a full network of hydraulic hose repairs in Nottingham, Langor, Melbourne, Newark-on-Trent, Hucknall, Eastwood, Kegworth, Long Clawson, Loughborough, Mansfield, Derby, Grantham, Bottesford, Ripley, Eastwood, Southwell, Melton, Quorn and Kegworth. With a network of 150+ engineers operating a 24/7, 365 days a year service. Offering hydraulic hose repairs in Nottingham and the surrounding areas. Hydraquip Nottingham is based in Nottingham South, East Midlands, close to Nottingham City Centre. The branch has excellent access to the Western Boulevard (A6514) which provides fast and convenient access to the A453 or the A52 which are both just 1 mile away and lead to Junctions 24 and 25 of the M1. 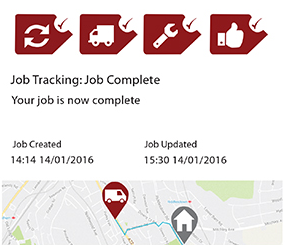 Hydraquip’s customers are provided with service job updates via SMS and email via the Job Manager app. The app is available to download for free on all Android and iOS devices from Google Play or the App Store.